Founded in 1912, Dale Carnegie Training has evolved from one man's belief in the power of self-improvement to a performance-based training company with offices worldwide. We focus on giving people in business the opportunity to sharpen their skills and improve their performance in order to build positive, steady, and profitable results. The franchisees around the world (190+) use their training and consulting services with companies of all sizes in all business segments to increase knowledge and performance. Headquartered in Hauppauge, New York, Dale Carnegie Training is represented in all 50 of the United States and over 90 countries. More than 2700 trainers present Dale Carnegie Training programs in more than 25 languages. Dale Carnegie Training is dedicated to serving the business community worldwide. In fact, approximately 8 million people have completed Dale Carnegie Training. Dale Carnegie Training emphasizes practical principles and processes by designing programs that offer people the knowledge, skills and practices they need to add value to the business. Connecting proven solutions with real-world challenges, Dale Carnegie Training is recognized internationally as the leader in bringing out the best in people. Ms.Vinita has around 10 years of experience in sectors like BFSI and education and prior to dale Carnegie she was working with multinational insurance company as Cluster Training Manager and was managing all the training requirement for Delhi NCR for all the channel within the organization which includes induction training program for the new employees, training requirement for middle management and all the channel partners. Such were the words of Dr. Vinita Yadav, in the guidance of whom we had a very dynamic and creative yet inspiring session held on 14th July 2016 in the auditorium of JIMS. 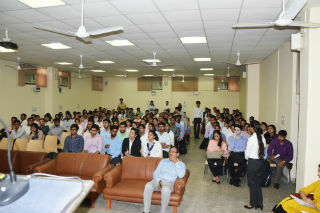 It was a very interactive, two-way, interesting session wherein Dr. yadav not only explained who was Dale Carnegie and his philosophies but also taught us various interpersonal skills, personality development strategies and the real meaning of ‘Communication.’ She gave various real life examples from her experience. The best thing about this session was that it included various fun yet learning activities like ‘Salad’ group activity in which students participated enthusiastically with Dr.Vinita and other activity was ‘Make a vision’ in which students played a role assuming themselves in a state where they have actually achieved their ultimate vision and how they are feeling at the moment after their vision is accomplished. 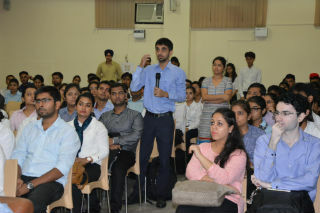 Various students were given a chance to come up on stage and share their views for which she gave feedback and on spot coaching. Though it was direct, it really helped everyone to know exactly where they lacked and what more was needed to be done. 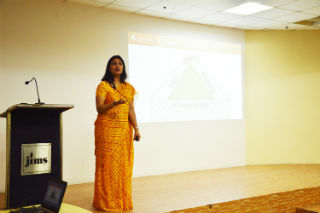 The session proved out to be very informative and enlightening because various topics that had been present in the minds of students contained various loop holes that were corrected and sorted out by her. 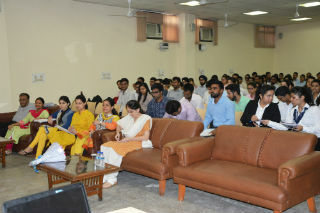 Three hour long session flew away like sand in our hands and students showed excitement and enthusiasm to carry on for more. 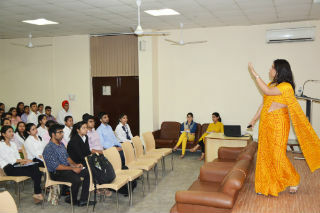 Her way of explaining things and mentoring was one of the best and crucial to train students for corporates. 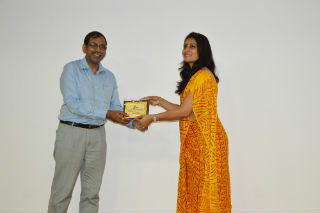 A special token of thanks to Dr. Vinita Yadav from all of the students and staff/faculty members of PGDM.